When it’s time to bring out the big guns for Christmas dessert, there’s only one recipe you need: the mighty Cherpumple. Technically six (yes, six!) 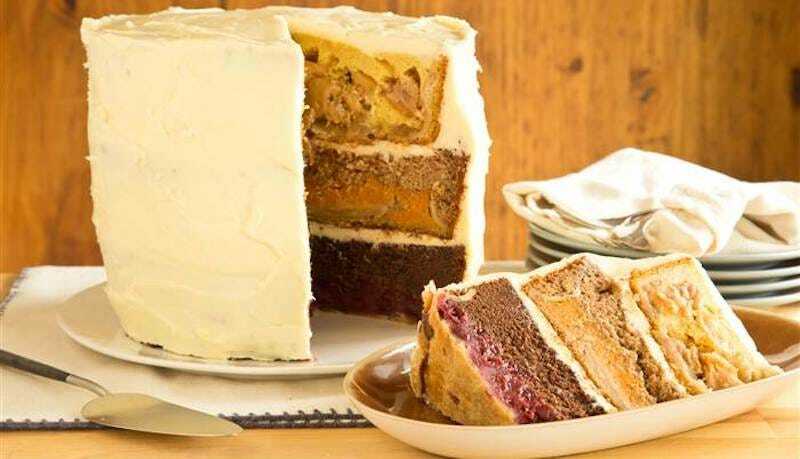 desserts in one, the Cherpumple combines cherry, pumpkin and apple pies with three different flavors of cake, all stacked high under a blanket of cream cheese frosting. Um, no it’s not “six desserts in one” because icing on its own is not a dessert unless you’re licking the mixing attachments or you’re going through a breakup and eating it directly from the Pillsbury container. Further, WHY WOULD YOU ICE PIE? We’ve already figured out pie! Nailed it! Pie is a perfect, bounded entity. It doesn’t need to be changed or bastardized by an over-eager food blogger who finally got her shot on the Today Show. Don’t you ever in your life do this. EDIT: It seems I misread and the six different deserts comes from three different types of pie and three different types of cake—a detail I assume my brain skipped over to save me from dropping dead from horror. Images via The Today Show.